The Fuerzas Comando 2018 took place in Panama from July 16-26. Special operations forces from 19 countries participated in the 9 day event. There about 700 operators participating in the SOF skills competition. The contest promotes multinational partnerships in the special operations international community. Exercise Scope. The 9-day event put the SOF teams through competition in weapons marksmanship, aquatic skills, tactical proficiency, and physical fitness. Last year the Fuerzas Comando 2017 was held in Paraguay. This SOF competition is held annually and first took place in 2004. The events are scored and evaluated by judges from each of the participating nations. Senior Leader Seminar. Taking place at the same time as the exercise was a three-day seminar for high-ranking members of the military and governments. They discussed opportunities to enhance regional and hemispheric cooperation. In addition, information was presented (exchanged) on threat networks in the region. Exercise Proponents. 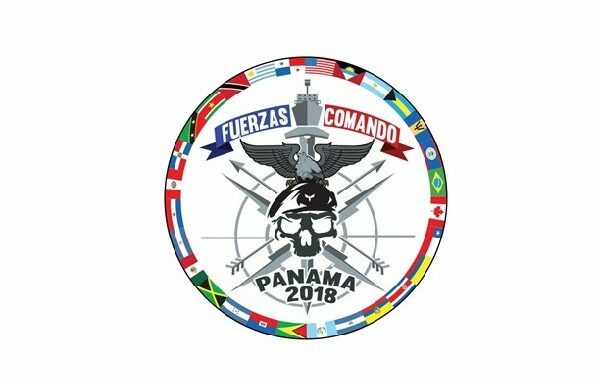 The country of Panama was the host for this years Fuerzas Comando 2018. The U.S. plays a major role in the exercise – the United States Southern Command (SOUTHCOM) sponsors the exercise while Special Operations Command South (SOCSOUTH) is the lead United States executing command for Fuerzas Comando 2018. Physical Fitness. The first day of the competition, following the opening ceremony, was the physical fitness test. The four tested events were push-ups, sit-ups, pull-ups, and a four-mile run. Ruck Sack March and Stress Shoot. The second day of competition began at midnight (cooler temperatures) with a 20-kilometer ruck march with competitors carrying a 55-pound pack and individual weapon. The ruck was followed by a stress shoot. Marksmanship. Teams from 17 countries competed in various shooting events in different areas of Panama on day three and four. The groups were divided into sniper and assault teams. They were then transported to their respective locations – La Mendoza, Instituto Superior Political, and Cerro Tigre for the sniper and assault competitions. Assault and Sniper Teams. The Assault Team competition consists of physical fitness tests, a confidence course, close quarters combat, rucksack march, aquatics, and an obstacle course. The Sniper Team competition consists of physical fitness tests, marksmanship, mobility, and concealment events. 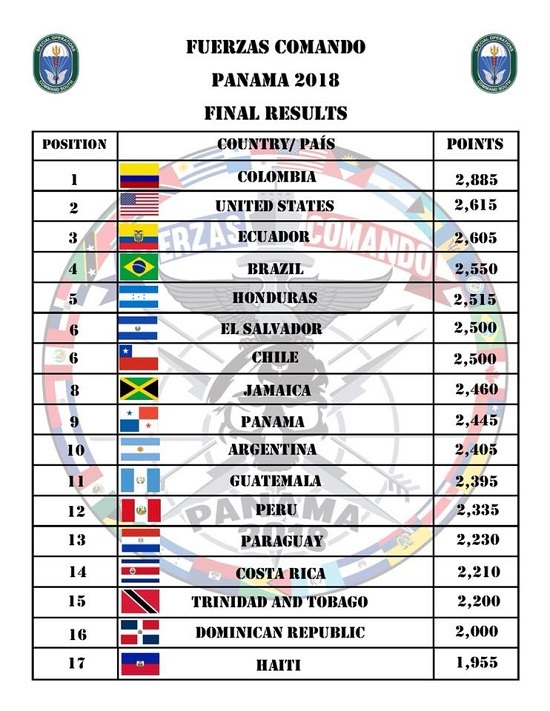 Colombia took first place while the U.S. (7th SFG team) was the runner-up in Fuerzas Comando 2018. Ecuador, Brazil, and Honduras followed in 3rd, 4th, and 5th place. The competition ended with the closing ceremony at the Instituto Superior Policial on July 26, 2018. Brigadier General Tony Fletcher – the commander of Special Operations Command – South (SOCSOUTH) was in attendance spoke to the assembled gathering. Fuerzas Comando Promo, SOCSOUTH, July 19, 2018. Special Operations Teams Square Off in Fuerzas Comando 2018, DoD News DVIDS, July 26, 2018. Photo: Fuerzas Comando 2018 logo from SOUTHCOM. Competition results posted on SOCSOUTH Facebook on July 26, 2018.